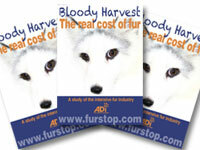 ADI’s undercover report and video on the fur industry entitled ‘Bloody Harvest – the real cost of fur’ reveals horrific conditions at 30 fur sites in Finland. The harrowing exposé includes: animals with open and infected wounds; obvious signs of untreated infection; eyes infected or missing; tails bitten off; deformed and damaged legs; overgrowing gum disease resulting in difficulty eating and drinking; babies with legs stuck through the mesh floor of the cage; dilapidated and dangerous caging and facilities; widespread animal suffering and neglect; empty, unclean and broken water bowls. Our 2010 expose was launched in Italy, France, Finland, Israel and the UK and received celebrity support from Twiggy, Alesha Dixon, Jenni Falconer and Mary McCartney. 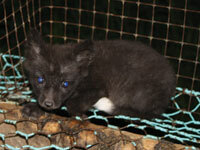 Many of the fur farms featured in our expose were certified by the Finnish government. Our investigation prompted both the Finnish Fur Breeders’ Association (STKL) and the Finnish Food Safety Authority (EVIRA) to carry out inspections on the farms. The Association’s own veterinarian inspected 28 fur farms, and found animal welfare shortcomings in six of them. Three of the farms had their certification of responsible husbandry revoked by the STKL, losing them all the discounts they would have been entitled to on fees charged by the auction company Finnish Fur Sales (FFS), resulting in losses of thousands of Euros. Fur is an unethical product and designers who wish to use it in their collections, or those who wear it, must take responsibility for the way that their product has been produced. Inspire change by writing to your local newspaper, high street stores and second hand clothes shops, and fashion designers. Click here for your free letter writing action pack. Help spread the word! Email us to order your ‘Is that fur real?’ action cards today. Donate to help ADI campaign for animals worldwide.